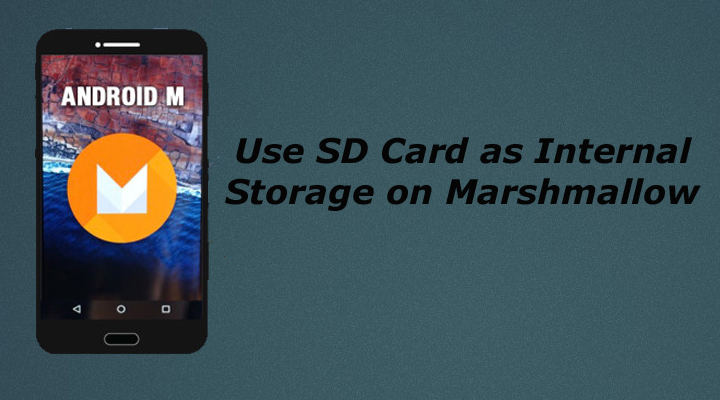 This guide helps to Use SD Card as Internal Storage on Marshmallow devices. As we know, Android Marshmallow comes with an Adoptable Storage feature which allows you to use your external memory (microSD card) as internal storage. Once you turn external SD card into internal storage on Marshmallow, you can install all your apps on your SD card directly. This feature is helpful for those who have low internal storage. Now they Use SD Card as Internal Storage on Marshmallow. Devices like Android one or many other devices faces the issue of low internal storage. They can’t install big apps or games or even the phone lags due to the low internal storage but for now, they Use SD Card as Internal Storage on Marshmallow to expand their internal storage. After you use sd card as internal, you can move files from internal storage to sd card. This feature only works with those devices which support external sd card, Means it will not work on the device with no sd card like Oneplus One, Galaxy Note5, etc. To Use SD Card as Internal Storage on Marshmallow, you need to format your SD card. And you have to format again if you are using your SD card on another device. Check the below steps to Use SD Card as Internal Storage on Marshmallow. 1) First, go to the phone Settings and select Storage. 2) Now select the SD Card, tap on three dot menu and click on ‘setting’. 4) Your device sd card is now format as internal storage. 5) Now select ‘Use as internal storage’ and tap on Next. 6) Restart your device and Enjoy. This is the complete guide for how to Use SD Card as Internal Storage on Marshmallow. If you have any questions, comment below. Hi can it be use for storing videos and photos after converting sd as internal..
Is sd card must have 16 gb ↑? same here, it is not working for Samsung J2 2016. Only option is to Format as Portable storage. Im using zenfone max and the only option is portable storage format no for internal. How to use my sd card as internal storage? Maybe your card is corrupt. Also try formatting with Linux or Dos (from command prompt) method. My microSD card also 64 gb became unrecognizable by my phone as well, plus windows 10 won’t let me format it. I had a microsd card adapter so was able to put it in my camera (Nikon) and the camera software automatically saw that it wasn’t formatted so I said yes to the formatting request. Worked when I put it back into my phone. I have also been able to get my card working again with EaseUS partitioning master pro software but the camera trick worked fine. Since then I have switched to the fastest microSD card I could get. how to vice versa the situation as i want my memory card to be separate from the internal memory. can i do my phone lenova a7000 after update Marshmallow ……? Did you format the Memory card after update it to Marshmallow? There is no option for making sd card as internal memory. I did the steps, i waited for 5 mins to complete the formatting and it said, “couldn’t erase sdcard”… can s1 help me pls? Seriously I can’t find the Damn “use as internal option” only portable..
Why my Samsung galaxy J5 dont have that option ? It appears that on v.6.0.1 there is no mention of using an SD card as internal storage, or the ‘Storage & USB’ named option in the settings menu. ok first of all there is no such (…) 3 dots option on sd card under storage section in my newly updated samsung galaxy j5. there is sust an upward arrow ooptio and every time i click it it unmounts my card. Can u tell me if i modoing anything wrong ? I don’t understood how that my fone storage to SD card….????? Sumit k4 note Lenovo I want to move apps on sd card but it not showing options how I moveapps? it shows on lenovo k3note “The sandisk card is formatted to work on this device only. it won’t work on any others.”……..what it means ……it will not acessable on laptop? Hi there, I am also facing same problem as Laxman i.e.“format as internal storage”. So please help. How to prevent SD card data from formatting after making it as internal storage. if i can able to remove my sd card after this process? I just purchased a new unlocked samsung galaxy s5 SM G900v. It came with Android version 6.0.1. When I insert a mmc card that has been formatted on my computer, it says unsupported SD card. I only have a portable storage option. When I select the SD card a menu pops up that says to use this SD card it must be set up. I push set up and a format menu pops up, I press format, it formats 20% then a menu pops up that says command 8 volume partition failed. This card works fine in other devices. I have wiped it clean and formatted it on my computer. I have tried several different cards with the same result. HELP! I would have NEVER purchased this phone without being able to use an mmc card for additional storage. I have another samsung galaxy s5 with lollipop and have no issues with the mmc card. How can I access the SD card used as internal storage in marshmallow from my pc in case of Lenovo phab?? If we format ext storage as it storage all files in ext storage will be deleted or not? How come when I go through file manager I can’t find internal storage. My PSP Isos are still there what do I do. How about Honor4x could it be possible? 1.How about Honor4x could it be possible?